About the Book: I'm Going to Give You a Bear Hug! Grand Rapids, MI--- December 27, 2016---I’m Going to Give You a Bear Hug!, written by bestselling author Caroline B. Cooney, is a playful and comforting bedtime book that imagines all the wonderful ways a child might give and receive a hug. I’m Going to Give You a Bear Hug is a sweet loving bedtime story book that is also sure to become a Valentine’s Day favorite for little ones who enjoy celebrating a day full of hugs and kisses from loved ones. I’m Going to Give You a Bear Hug will be available in hardcover for $16.99 in retail stores nationwide and online on December 27, 2016. Pre-order opportunities will begin on September 28th. Caroline B. Cooney was born in New York, grew up in Connecticut, and now lives in South Carolina. Caroline is the author of 90 Young Adult novels in many genres, and her books have sold over fifteen million copies. I’m Going to Give You a Bear Hug is her first picture book. It’s based on a verse she wrote for her own children, Louisa, Sayre and Harold, who are grown now. I'm Going to Give You a Bear Hug! is a rhyming, goodnight tale for ages 4-8. My son is three years old and has asked to read the book over and over again. On the second reading I accidentally skipped a page and he called me on it! He must have really been paying attention to remember every page after one reading! :P The illustrations are big and colorful, which really draws my child into the story. 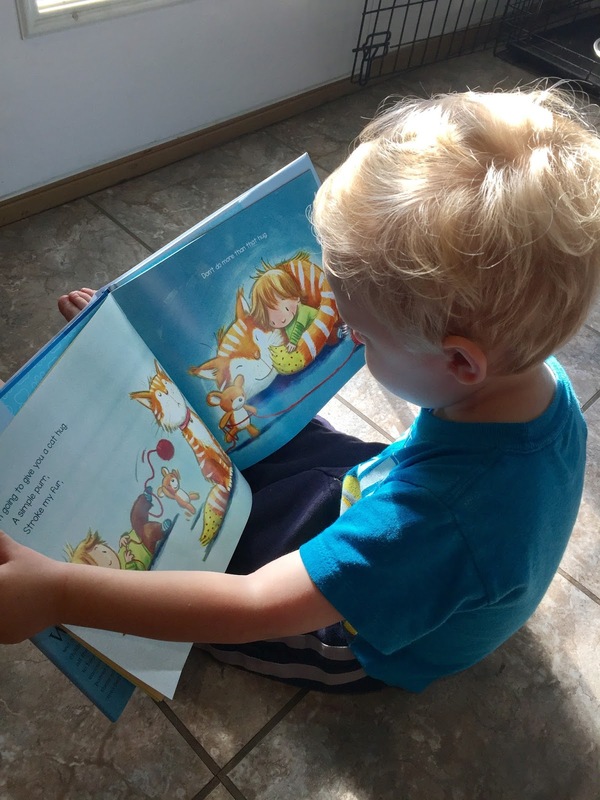 He loves all the animals on the pages; the pig hug being his favorite. My daughter is one and isn't super into books yet, but will sit to see the animals on the pages. This book is definitely a keeper in our household. I received this book free to review from FlyBy Promotions, but all opinions are my own. Ends 2/10/17. If you win, you will be sent an e-mail and have 24 hours to respond or a new winner will be chosen. US only. I would read it with my son. I would share this with my grandsons who love to have me read to them. I would share this book with my little peanut! She loves bears! I have two toddlers that would absolutely love this! I would read this to my daughter as well as my nieces and nephews! I would read this with my 2 and 4-year old grandchildren! I would share this book with my kids! I would read it to my son. I would add this to my son and daughters night time book collection! Sounds super sweet. My son. He is obsessed with bears! My babies and toddlers and their caregivers in my Baby and Toddler Story Time. I would share this book with my nieces and nephews! kristiedonelson(at)gmail(dot)com Thank you. Happy February! I would share it with my 4 younger kids. I would share this book with my sons. My little girl would love this book. I would share this with my grandchildren. I would share it with my daughter. :) She loves books, storytime is her favorite! I'd share this with my almost two-year old. :) We love reading together. I would read this cute book to my three year old grandson. I would like to share this with my youngest granddaughter and grandson! I would share it with my daughters. I would read this book to my grandson Kaiden. I would share this book with my grandchildren, thanks! I would share this with my little grandson. Thanks! I would share the book with a number of people! I would definitely share this book with my daughter! My grandchildren would just love to have the I’m Going to Give You a Bear Hug! book. I have grandchildren that would really like the I’m Going to Give You a Bear Hug! book. My nieces and nephews are into to fun books and need the I’m Going to Give You a Bear Hug! book. My nieces and nephews think the I’m Going to Give You a Bear Hug! book.would be fun and cool to read. I have many children, and they would definitely enjoy reading the I’m Going to Give You a Bear Hug! book.